I wanted to make one of my daily posts about my holiday as I think it's good to get to know the person behind the blog. 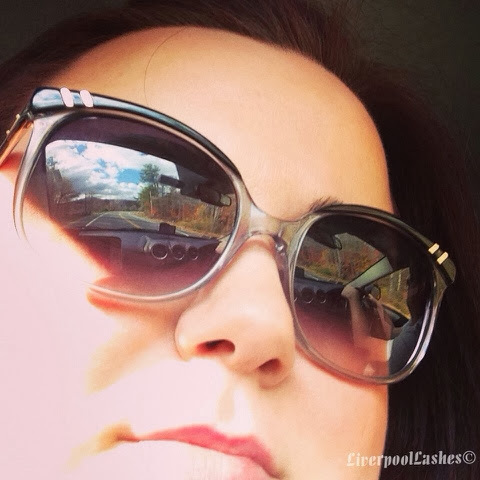 I did instagram photos throughout my holiday, if you don't already follow me please search for 'liverpoollashes' or click here, I'd love to talk to you on there! Firstly we flew from Manchester to Heathrow and then on to Boston, Massachusetts. I've never been to Heathrow before, I hate the hassle of indirect flights but it was an eye-opener. Heathrow is like a shopping centre with an aiport attached. I was not expecting to see a Harrods, Gucci, Bvlgari, Tiffany and various other high end companies at an airport - craziness! When we finally arrived at Boston we picked up the SUV that we were hiring and drove to the hotel. 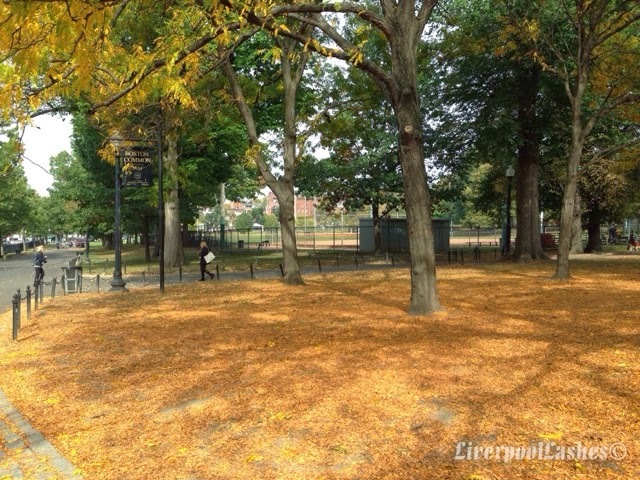 Boston is beautiful made even prettier by the 'fall' leaves. The above photo is of Boston Common which I believe has links to Central Park in Manhattan and definitely has that feel to it with the tall buildings surrounding it. The hotel we stayed at here was called Revere Boston Common. It was a pretty swanky hotel which was paid for by my husband's work as he won a city break and they allowed us to use it on this hotel. The thing that will stick in my mind is the scent in the hotel reception. Although we'd had a long day travelling when we arrived there I was instantly calm and happy as they seem to pump a green tea fragrance into that area and it was absolutely gorgeous. It reminds me of Elizabeth Arden Green Tea Scent Spray so much. 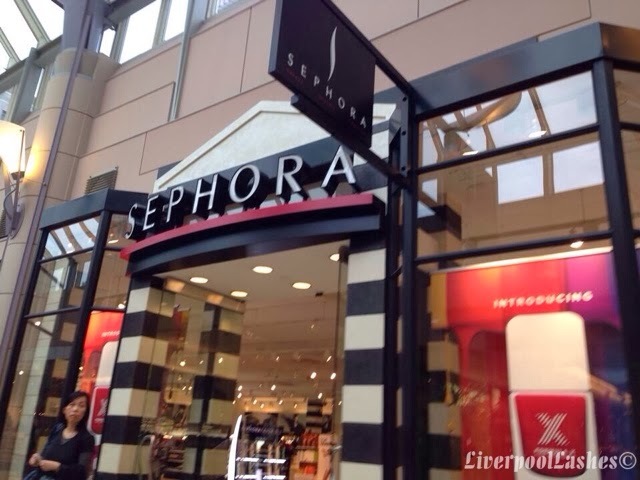 My first stop was Sephora as I had a ton of stuff to buy. Our plan was to travel around New England and then fly to Chicago. Eventually the flight from Chicago back to Manchester we were paying for an extra suitcase so I couldn't go too crazy with my purchases until we arrived in Chicago. I have done a blog post on my Sephora purchases with a video - please click here to watch that massive haul. After a few days in Boston doing all of the typical touristy stuff like getting on those hop on/hop off buses and wandering around, it was time to pack up our suitcases and head in our huge jeep thing to Maine which is a good few hours drive. 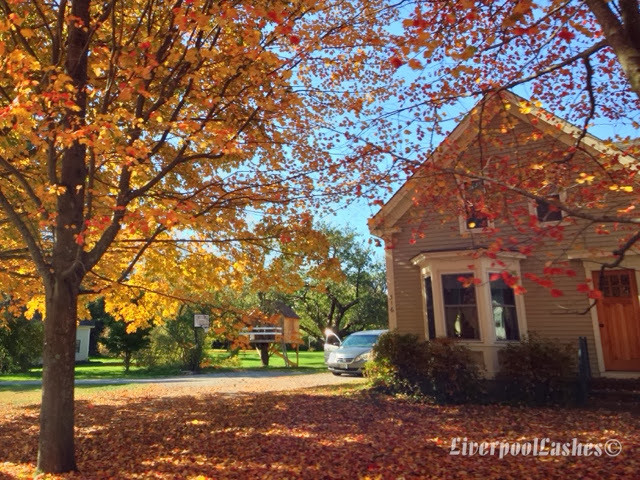 We knew this when we booked it as New England is known for doing the drives in between in Autumn to see the leaves, it truly is a beautiful place. The above and below photos are just places we passed on our travels. I love these type of houses, like a tongue and groove style painted in a pale colour like green or blue with white. On the way to Maine we made a planned detour to The Kittery Outlets which is a group of 6 buildings spread across a good patch of land with well recognised named shops like Old Navy, American Eagle, Swarovski, Coach and various others selling their stock as hugely discounted prices. If you are ever in that area I would highly recommend you pass through that way. The hotel we stayed at in Maine was the Hilton Garden Inn Auburn Riverwatch which was beautiful. The day we arrived was our five year wedding anniversary and although we didn't tell them this the manager heard our British accents and said that they 'love international visitors' and upgraded our room which was lovely. Whilst we were in Maine we just visited the shops and drove around to as many places as we could. The hotel was a little far out which we knew this when we booked but we love the Hilton Garden Inn hotels as their beds are SO comfy! 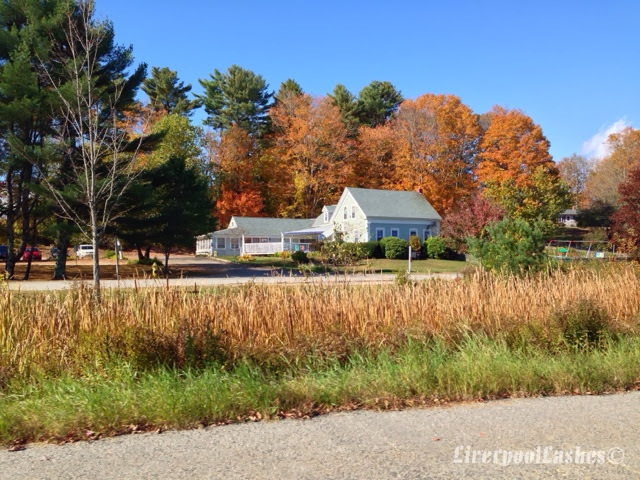 After a few days it was time to gather our belongings and travel to Vermont. On the way there we saw some beautiful views, lakes and rivers. I wanted my eyeballs to capture every second and I know that although I took a gallon of photos they really don't do it justice. The scenary in the above photo was a million times prettier. On our way to Vermont we had organised to go to the Ben & Jerry's Factory as this is where it all started for them. It was only a few dollar to visit it and we bought a t shirt for my husband and a few other souvenirs. I did put a few photos on my Instagram click here. This was definitely another place I would recommend as somewhere to stop by if you're close to there. The best part of the holiday for a beauty junkie like me was that I could stop at any drugstore, Walmart, Target... whatever I liked! 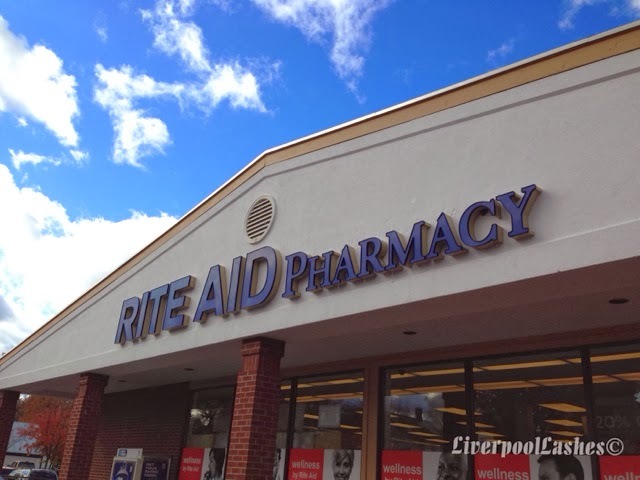 It felt like there was a drugstore on every block over there - I loved it! Vermont didn't have as much in it it seemed like, or at least not much around where we stayed which was the Courtyard by Marriott Burlington. From the outside this hotel didn't look anything special but the rooms have been refurbished and it's a comfy place to stay. Unfortunately the time eventually came to start heading towards the airport and leave beautiful New England. The above photo I took on our way between States. I have developed a slight obsession with reflections in photos. This is inherited from my Dad (Shout out to Pops!) as it gives a hint of something else that you were not expecting to see in the image. Obviously I did this purposely to capture the view. We did have an overnight stay in Manchester, New Hampshire at another Hilton Garden Inn. I did manage to visit a Target store on the way to that hotel too which we planned into our route as there didn't seem to be many around at all. 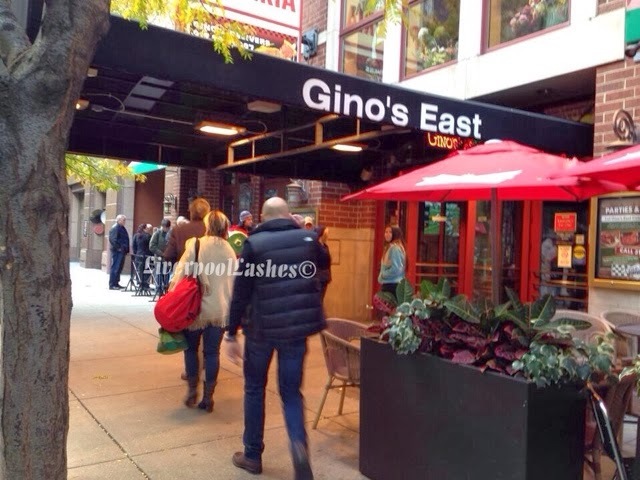 One place that my friend insisted we went to in Chicago was Gino's East which is an authentic italian restaurant known for their pizza and the fact it has been featured on 'Man Vs. Food.' Hilariously it actually turned out that it was directly next door to our hotel which was the Mile North Hotel so we went there twice in our four night stay. I took the photo above when we came out of there at lunchtime. It was so weird because when we went in there was only a five minute wait inside and then when we came out it was around 2pm but a queue had formed outside, just for lunch! Obviously I couldn't just show you the restaurant without showing you the famous pizza. 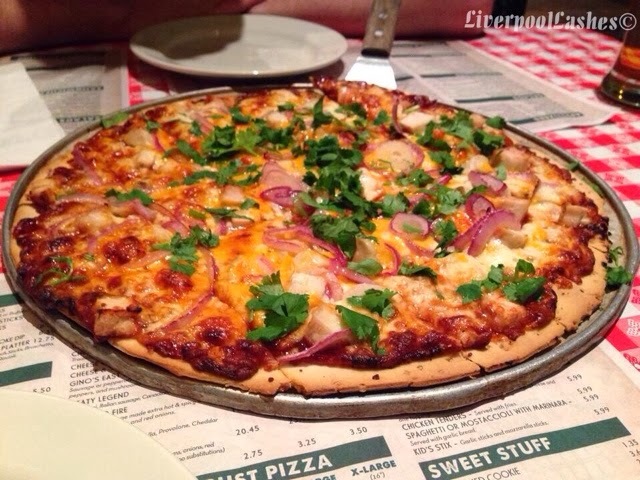 This is their BBQ Chicken Thin Crust pizza and I can confirm it was delicious. Unfortunately like all things our holiday had to come to an end. Expect reviews of all the new fun products I purchased whilst I was away, I couldn't resist starting to test some of them right away! I hope you enjoyed reading this snippet of my adventures! 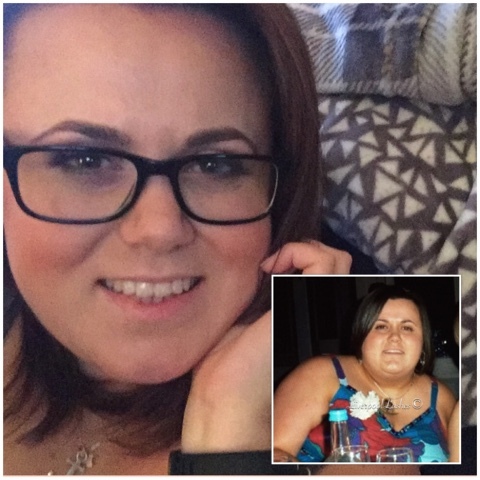 Fantastic blog post, I really want to go now!! Was wondering how you got all your goodies back, an extra suitcase!!! Lovely post, amazing pictures! 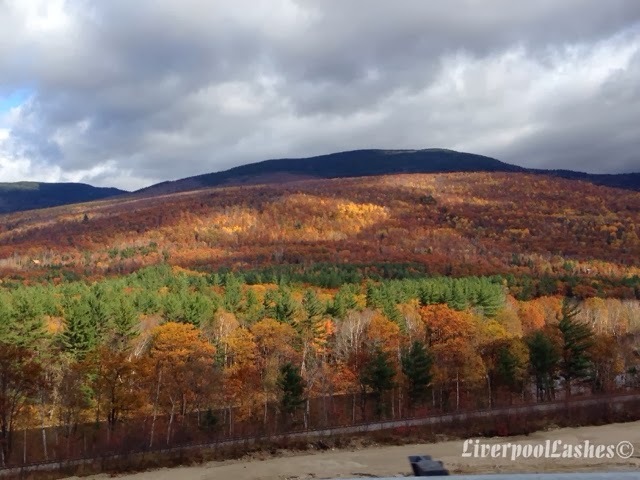 New England is somewhere I've always wanted to visit, especially in fall.